Nakivo Backup & Replication is quite new in the Backup scene. Now with version 4 it became a real enterprise backup, packing features and prices that may disrupt competitors. Backup industry is experiencing massive growth, mostly because companies around the world are virtualizing their server infrastructure. 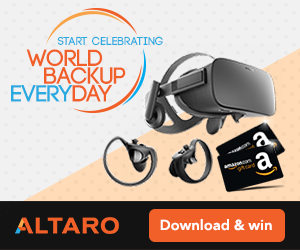 Established backup brands were not prepared for virtual environments (backup exec is one such examples) and delivered overpriced, under performing products. When companies discovered they were let down by Symantec and other enterprise backup software brands, they turned, looking for alternative to backup exec or similar product they used. Some have opted for on line data backup and some for on premises backup product that enables offsite server backup. Nakivo Backup & Replication is a VMware only product and supports only virtual infrastructure. It does not backup physical servers. And that is fine. 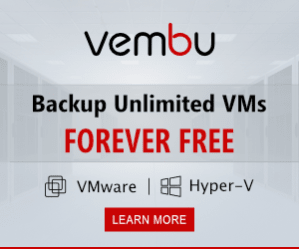 As people use their legacy backup software for remaining physical servers and use a separate product for virtual backup. Nakivo Backup & Replication offers Windows installer, Linux installer or OVF virtual appliance. Speaking of Appliance, there are two versions, one is for regular backup and the other is for tennnat backup (more on this later). Deployment is simple and multi OS installer is a great feature I wish all the vendors had. 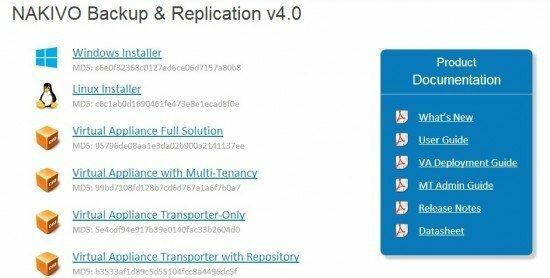 Nakivo Backup and Replication has a web GUI, which is a refreshment, you don’t have to install the product client on every PC you would like to manage it from, or worse, log in via RDP to the server. But where WebGUI shines is accessibility from mobile devices. Web GUI is inspired by old Mac OSX brushed aluminium interface, with slight touch of dark gradient. It’s not the most modern interface nor is it adhering to the latest GUI guidelines, but it’s simple, intuitive and gets the job done. You won’t have to read the full admin guide to learn, how to use the product. 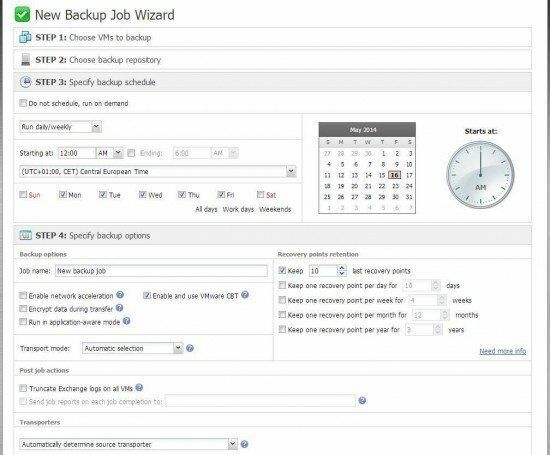 Once you add your infrastructure, you can start a new backup job by pressing on Create button. You can choose replication or backup. First you choose your Virtual servers and then wizard guides you to the next step. You can have more repositories and you can specify backup schedule. While Nakivo claims to support GFS rotation, it suffers the same problem as did Veem until version 7. It’s missing: Backup the last day of the month, you can select custom day of the the week for last day of the month however (last Friday, last Sunday…). You are able to select Transport mode and set Nakivo to use either SAN only or LAN only transport mode, just in case automatic selection doesn’t work. 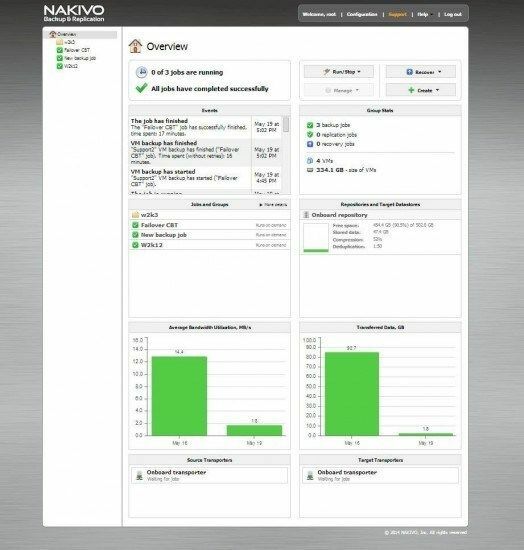 Nakivo Backup & Replication v4 also supports network acceleration, encryption and VMware CBT. Similarly to Veeam, you can choose to “Run backup in application-aware mode”. That means that Nakivo will levrage VMware OS quiescing to ensure consistent application data in the backup. You can see a running job with all the information’s in the job tab. You can see, which servers are being backed up, information about schedule and options, informations about storage repository and running time. Nakivo uses Backup verification, it checks backups blocks by block and compares data to the source VM. Once backup is completed, you have a backup that can be restored. Replication job configuration is similar to backup configuration. One missing feature with Replication is to continuously run the job. You do have an option to run it periodically though (every 30,40…minutes). Recovering backup is simple. Backup recovery is a wizard driven process where you can choose many options. You can choose where to recover, to which data store to recover (can be by HDD, HDD1 – vmstore1, HDD2 – vmstore2…) and which network interface to use. Nakivo has support for cloud backup. But with a caveat. Unfortunately, it only supports Amazon AWS. There is no support for Amazon Glacier, MS Azure, Rackspace, Google storage…I hope they will add additional cloud services in the next version. On a bright side, cloud support is included in the price, unlike some competing products where they charge premium for Cloud edition. I hope they won’t change their mind in the future. Nakivo can restore individual File & Exchange objects. 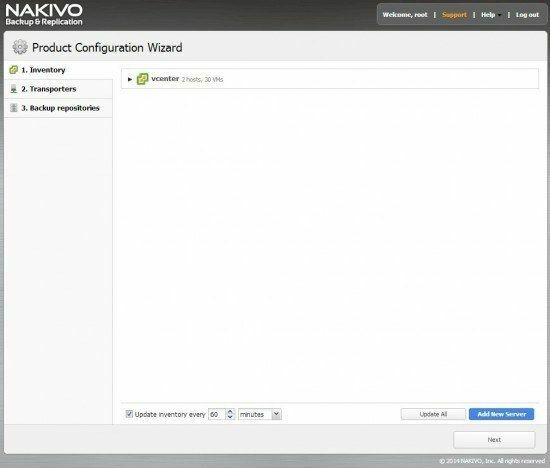 If you ever had to deal with Backupexec exchange restore, you will be delighted by simplicity of Nakivo solution. Poison is in small bottles, Nakivo calls it Multi-Tenancy. You can start your own online backup business with Nakivo Backup & Recovery. Just the other day a friend from another company called me and said that he would need offsite server backup, to comply with audit he had. I have some free resources and I could be selling him offsite backup service. My company would be pleased to cover for some IT costs and he would be happy to comply with an audit. If you are service provider, Nakivo offers cost efficient and reliable solution for online backup business. Nakivo Backup & Replication is very affordable. 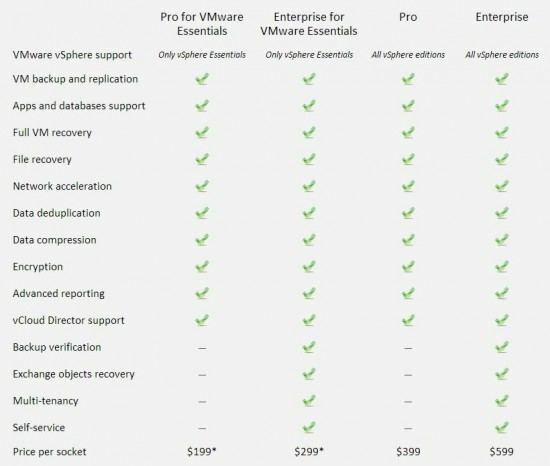 PRO Edition for VMware Essentials is $199 per socket, Enterprise version for VMware essentials is $299 per socket. Pro version for all vSphere versions is $399 per socket and Enterprise for all vSphere editions with Exchange objects and file recovery is $599 per socket. Pricing is affordable compared to other solutions. During the testing, Nakivo Backup & Replication proved reliable, I didn’t have any problems. I was amazed by the backup processing speed. It’s fast and once it’s running, web user interface experience isn’t affected by the running backup jobs. I was shocked to see deduplication ratio of 1:50 in addition to 52% compression. You won’t see that with Veeam, Veem uses per job deduplication and recommends using 3rd party deduplication like MS Server 2012R2 or special deduplication appliance, where Nakivo uses repository based deduplication, meaning that all the jobs will benefit from global deduplication. 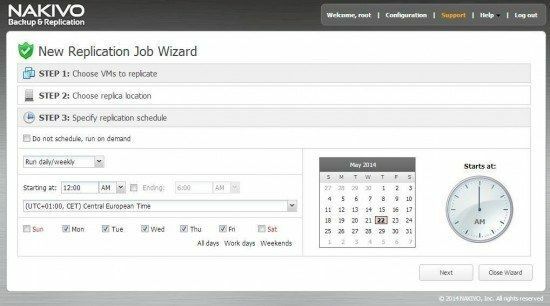 Nakivo has some nifty features, for example job grouping, you can group jobs by department for example and avoid having a mess with multiple jobs in one place. Web GUI is also a welcome addition as you can easily log on to Nakvio Backup & Replication from your tablet at home while watching the news. Last but not least is performance, you don’t require super computer to benefit from compression, global deduplication or fast backup performance. You only need 2 cpus and 2GB ram for great performance. Some competitors require 4CPUs and more than 4GB Ram for optimal performance. Perhaps the biggest drawback with Nakivo is that you can’t define to backup your job on the last day of the month (Veeam fixed that with version 7) and VMware only support. Nakivo Backup & Replication is what name implies, a backup and replication product. It doesn’t have exotic feature list, but so does it not have exotic pricing. 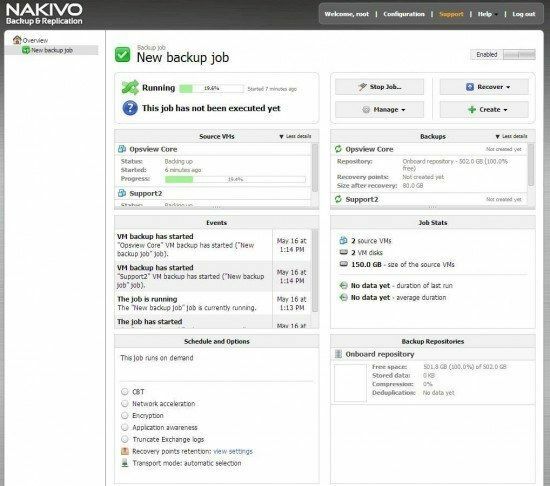 If you are looking for VMware backup, give Nakivo a try, you may really like it.